In the Options dialog select the Viewers Panel. 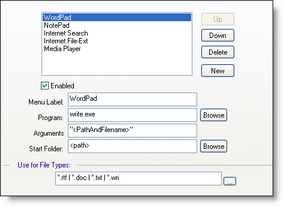 If the program field is empty and the Arguments field contains "<PathAndFilename>" FileBoss will attempt to open the file using the default program for that type of files. This can be useful for standard file types such as MP3 and TXT files. 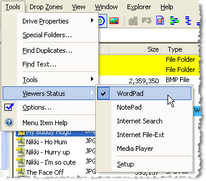 The tools will be then be displayed on the main menu and right-click menus when a file they apply to is highlighted. (showing that the WordPad tool is active.